In 1789, George Washington was unanimously elected to become the first President of the United States of America. According to early protocol, the man who received the most votes from the electors would be nominated President, while the man who received the second most would become Vice President. Alexander Hamilton, Washington’s secretary during the American Revolution wanted to make sure that Adams did not get so many votes as to prevent a serious challenge to Washington. So, Hamilton worked tirelessly through the winter to make sure that electors cast their ballot for the revolutionary war hero. On April 13, 1789, Adams departed his native Braintree for New York where he would assume the duties of Vice President, second in command only to George Washington. It was a proud moment for John Adams. Passing through Massachusetts and Connecticut, he received a warm welcome from his supporters. In Hartford, Connecticut, Adams was presented with a bolt of broadcloth that he would use for his inaugural suit. 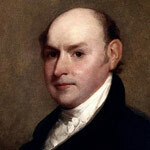 Arriving in New York on April 20, Adams was formally received by the Senate at Federal Hall the next day. Sitting in his chair at the front of the building, Adams addressed the Senate. He expressed a warmness and gratitude for being selected to such a position, and even said that he was proud to be among the “defenders of liberties.” He thanked the delegates for creating the Constitution, and promised he would follow it to the best of his abilities. Next he lauded Washington, and credited the divine hand of God for uniting the American people with such a capable leader. After his address, the Senate immediately launched into a discussion over matters of proper conduct, such as how the President and Vice President should be addressed, and the Vice President’s responsibilities to the Senate. Two days later, Washington arrived in New York to be sworn in as the first President of the United States. Walking out onto the balcony of Federal Hall, in view of thousands of people Washington vowed to “preserve, protect, and defend the Constitution of the United States.” At the end of the oath, Washington added his personal touch by saying “so help me God” then raised the Bible, and kissed the cover. And so the first administration took office in an atmosphere of good feelings. After Washington’s inaugural address, the Senate launched back into the discussion of proper decorum between elected government officials. Of chief importance to Richard Henry Lee was the President’s official title, and how Senators should address the leader of the republic. Titles were of utmost importance to the people, Lee asserted, as there was something in human nature that responded to them. Senator Izard agreed, and moved that the President should be addressed as “Excellency.” Soon after, a committee was appointed to deal with the question. Adams was a very vocal member of the committee, as he was passionate about the issue, and had several notable disagreements on matters of decorum with Senator William Maclay from Pennsylvania. Maclay kept a journal of the committee’s dealings, and his account of Adams was less than flattering. What seemed to be a trivial issue would eventually provide fodder to Adams’ opponents who would paint him as a monarchist. 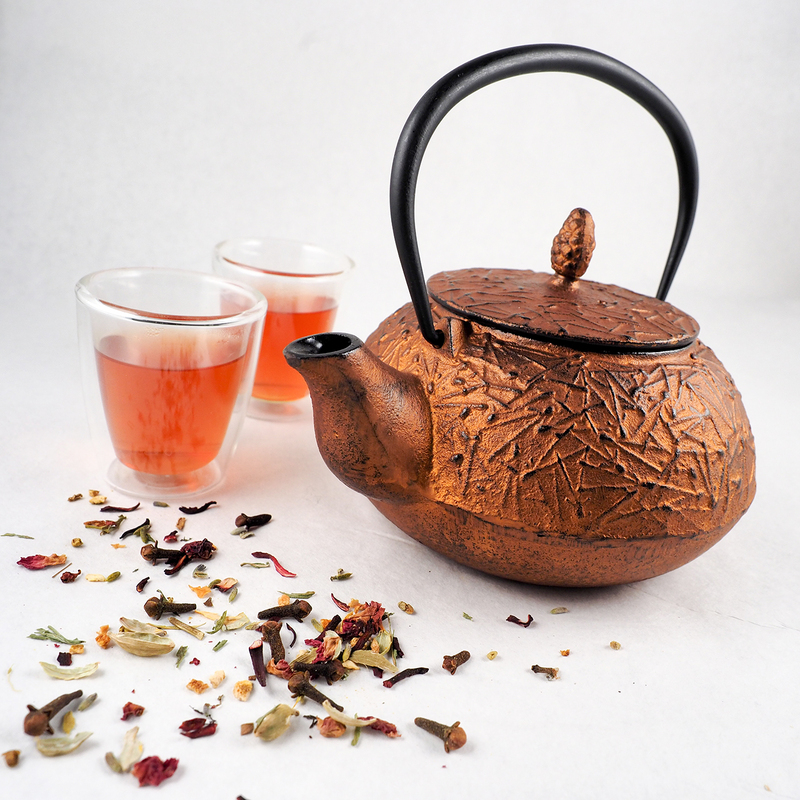 a thorn in Adams’ side. When seeing Adams presiding over the Senate, sitting in his chair, Maclay could not “help thinking of a monkey just put into breeches.” At a meeting of the Senate, Maclay stood up and cited the Constitution, which declared no titles of nobility “shall be granted by the United States.” When Ralph Izard jokingly suggested that Vice President Adams should be addressed as “His Rotundity” the entire hall burst into laughter. Unfortunately for Adams, his newly acquired nickname would stick with the press. For the remainder of his public life, the burgeoning Democratic-Republican press would become a headache for Adams. Notwithstanding, for the first couple months of Washington’s administration, all seemed to be well. But the new country faced serious issues. For one, the thirteen colonies had never been united in such a way, not even under the rule of the British government. All had operated on their own, and all of the thirteen states had their own insular culture, economy, and outlook on domestic affairs. Each state had its own form of currency, and depending on their involvement in the American Revolution, they had assumed varying war debts. To the American leaders was left the challenging task of solving these issues while keeping the country united under one banner. The cabinet that Washington appointed consisted of Alexander Hamilton, the Secretary of the Treasury, Edmund Randolph, the Attorney General, Henry Knox as the Secretary of War, and Thomas Jefferson as Secretary of State. It was a diverse cabinet composed of members who would grow apart based on their conflicting political views. As time would pass, Adams would have difficulty reconciling his differences with Jefferson and Hamilton in particular. Hamilton was a headstrong politician who held onto grandiose dreams of forming an empire in the new world. But before embarking on a campaign of military conquest, Hamilton was acutely aware that America’s status in the world must be solidified. Hamilton believed that America’s credit should be established first. All of the thirteen states had fought during the War of Independence; some accrued higher debts than others. Hamilton proposed that the United States should establish a national bank which would absorb the debt as a federal burden. 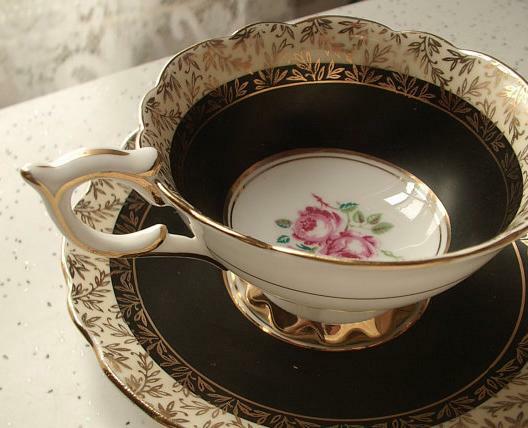 This issue almost immediately divided Washington’s government. 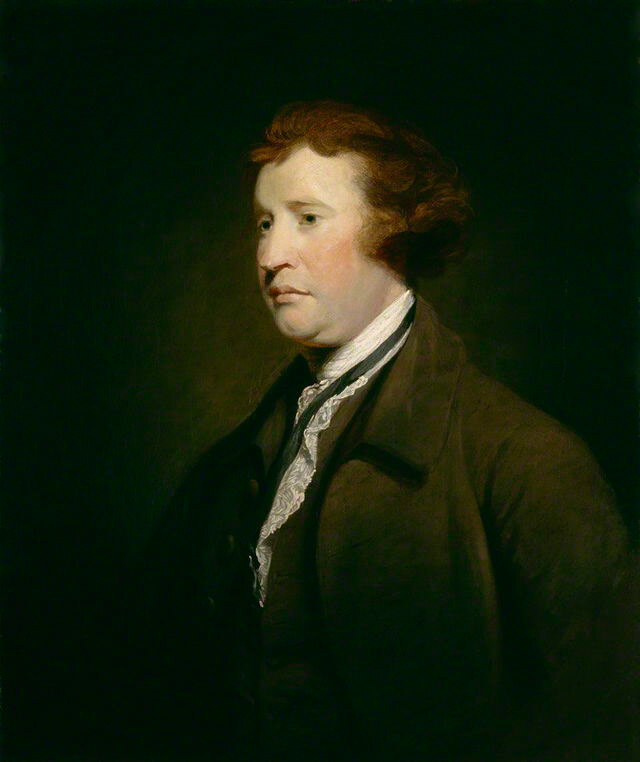 Edmund Burke, Joshua Reynolds, 1771. National Portrait Gallery. Thomas Jefferson, on the other hand, supported the French in their endeavors to establish a republic. Jefferson was certain that the struggle for liberty was the same in France as it had been for the Americans in the struggle against Great Britain. For this reason, Jefferson believed that Americans should support their French brethren if for nothing else, because the French had aided American patriots in the War of Independence. 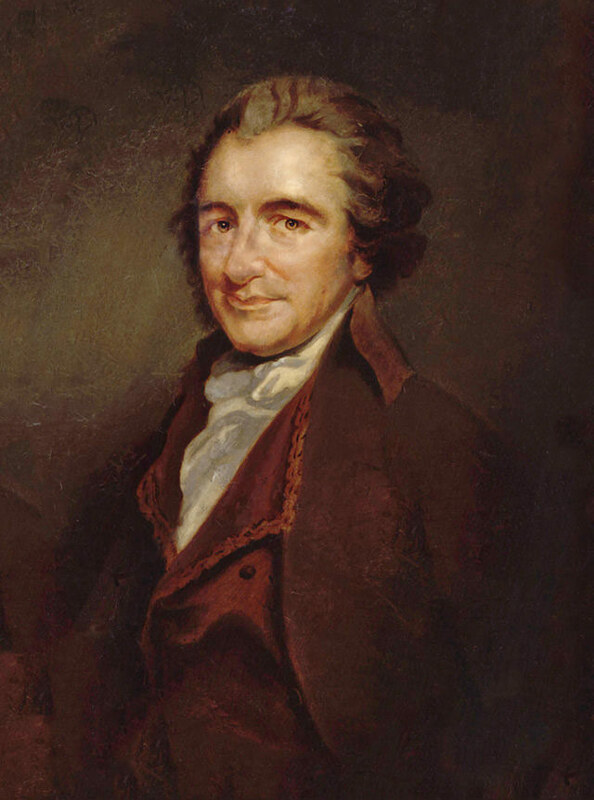 Then in 1791, Thomas Paine issued a response to Burke’s Reflections by publishing the Rights of Man. 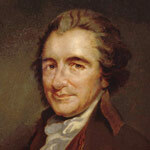 Paine refuted Burke’s claims, and even advanced the concepts of human rights and equality. Jefferson, who received a copy, quickly passed it along to a printer in Philadelphia with a private note that Paine’s work would be an appropriate response to the “political heresies that have sprung up among us.” Unbeknownst to Jefferson, the printer included his note on the title page of the edition, which attributed the quote to the Secretary of State, which was none other than Thomas Jefferson. Thomas Paine, George Romney, 1792. National Portrait Gallery. It was understood that John Adams was responsible for the political heresies Jefferson was referring to. Adams did not respond to Jefferson either publicly, or privately, but there is no question that Adams was offended by Jefferson’s remarks. Jefferson was an old friend of Adams who supported American independence at the Second Continental Congress. But now, it seemed that the growing divide between the two dominant political parties had ruined their friendship. 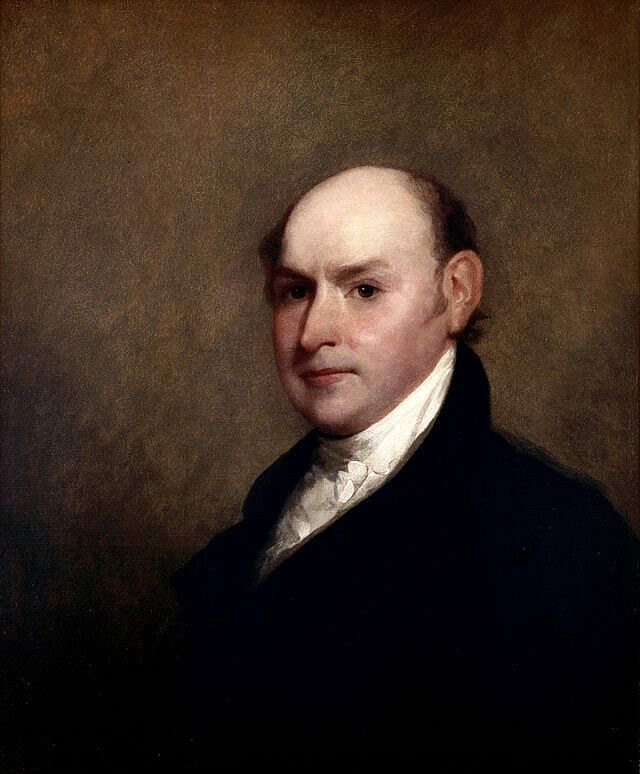 John Quincy Adams, Gilbert Stuart, 1818. The White House Historical Association. But perhaps most insulting of all to Adams was his exclusion from Washington’s inner circle. 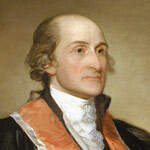 Adams, upon being elected Vice President, expected that the first President would seek his counsel. 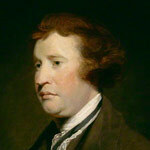 Instead, he relied heavily on the advice of Alexander Hamilton and other members of his cabinet. One of the unforeseen consequences of Adams’ vice presidency was his exclusion from public life. He tried his best to insert himself into the matters of the Senate as much as possible and only as much as the Constitution would allow. Yet, it was soon that he realized he was only to be a figurehead, perhaps even the least important public servant in the United States. Adams was determined to have a say in public affairs, but there were others in his own party of Federalists who were just as determined to limit his influence, and Adams feared that Washington was one of them. To complicate matters, there seemed to be growing tensions between the Federalist and anti-Federalist camp over support for the French Revolution. Jefferson and his band of Democratic-Republicans believed in the aims of the French Revolution, and even suggested that it would be sound foreign policy to take up arms against the monarchists that wished to restore King Louis XVI to the throne. On the other hand, Federalists like Alexander Hamilton desired a strong central government. In order to achieve such a goal, Hamilton wanted a new army to be built to defend America’s frontiers, and if necessary, even declare war on the European powers. Caught in the middle of the debate was John Adams, who much like George Washington, wanted to stay out of foreign affairs as much as possible, so as not to upset the development of the newly independent United States. But news from France seemed to get worse and worse by the day. By 1792, the Jacobins had seized power, and King Louis XVI was being held hostage at the Tuileries Palace in Paris. On August 10, a mob stormed the palace, killing nearly five hundred of the King’s Swiss guards. The mob forced King Louis to don a liberty cap, as the besiegers passed by cursing him and spitting in his face. Then, just a few weeks later, with the war against the First Coalition going poorly, the Brunswick Manifesto was read aloud in Paris. The Duke of Brunswick, who had invaded France with a sizeable Austrian army, declared that he would restore the Bourbon monarch to the throne, and punish the supporters of the revolution. In early September, a great panic swept through Paris. Fearing that there were enemies within, a mob descended upon French prisons, holding mock trials, and executing all of the prisoners for treason. By the end of the September Massacres, close to 1,400 political prisoners were executed by French radicals. As the months went by, the terror sweeping through France would only increase. In July of 1793, the Committee of Public Safety would seize control of the French government, and institute the Reign of Terror. Thousands of “enemies to the revolution” were butchered by a new, more efficient killing machine called the Guillotine. Maximillian Robespierre, as a private citizen was against the death penalty, but as de facto leader of revolutionary France, Robespierre believed the executions were not only necessary, but more humane thanks to the Guillotine. Ironically, the revolution would turn on its creators, and Robespierre himself would fall victim to the device on July 27 (9 Thermidor), 1794. It seemed as though both Burke and Adams were proven right. Most disturbing to onlookers of the conflict was the treatment of American sailors by the belligerent European powers. With hostilities resuming again between Britain and France in 1792, American ships, which were neutral in the fight, were being seized by British and French warships alike. Federalists began clamoring for a declaration of war. Seeking to avoid war, Washington dispatched John Jay to London in an attempt to end the impressment of American sailors by the Royal Navy. When news of the Jay Treaty arrived, Americans, both Federalists and Republicans alike were outraged. Apparently, Jay had not been the best negotiator. 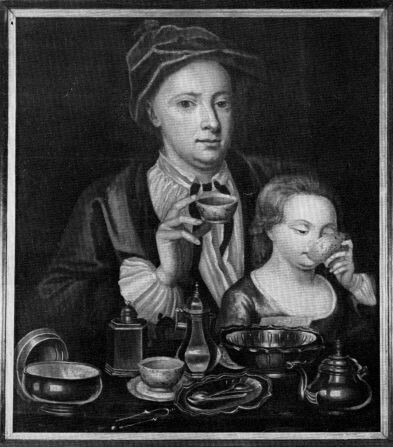 Jay relinquished nearly all of the terms to the British. 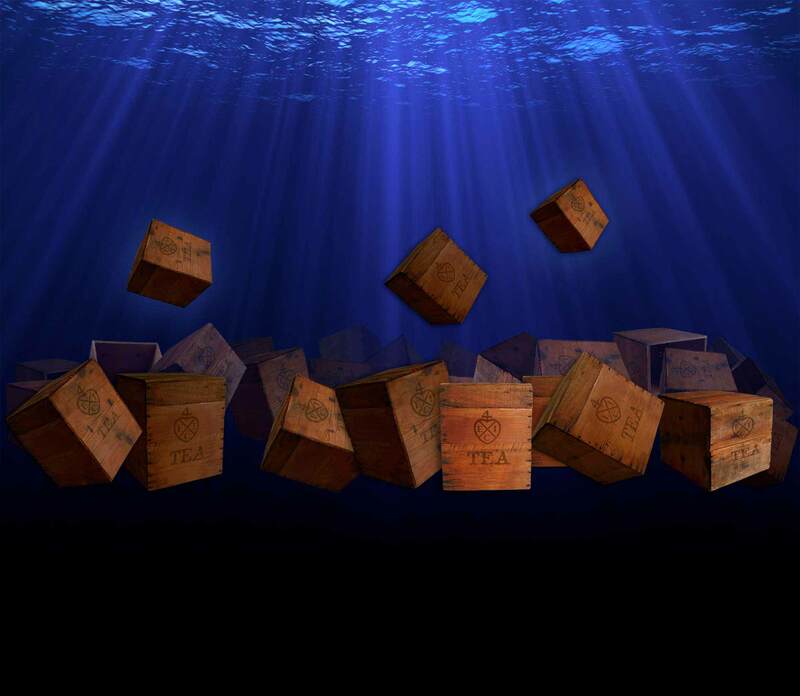 Perhaps most unnerving was Jay’s failure to secure a safeguard against the seizure of American sailors by British warships. 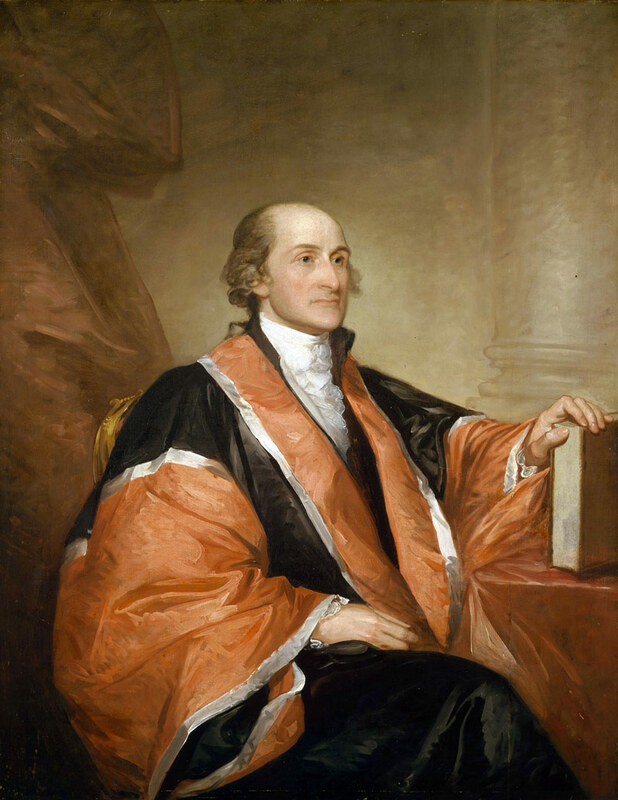 John Jay, Gilbert Stuart, 1793. The National Portrait Gallery. The following year, Washington announced that he would retire following the end of his second term as President. John Adams and Thomas Jefferson were the apparent heirs to take office. The National Gazette ridiculed the Federalists for being monarchists. The Aurora, a republican newspaper printed by Benjamin Bache mocked Adams for sympathizing with the British; he was even personally attacked for his “sesquipedality of belly” and his “rotundity.” The Boston Chronicle warned its readers that if Adams were elected, he would just as soon install a hereditary monarchy. Adams never responded to his critics, or actively campaigned for the presidency.